2 young ladies and 14 young men have been working on this very personal vehicle project of theirs since November 2013. The apprentices have been given free rein in their creativity. Skoda Chief Designer, Jozef Kaban and his team have provided support along the way, and the project is nearing completion. This is the first time that this kind of trainee project has been undertaken at Skoda. The aim has been to encourage the apprentices' creativity and expertise in bringing their own ideas and enthusiasm into designing a car. "It is fantastic to see how committed and passionate our trainees have been in working on this project," said Bohdan Wojnar, Skoda Board Member for HR. "The Skoda CitiJet is an emotional vehicle study that is sure to catch the attention of the visitors at Worthersee." The Skoda CitiJet is a dynamically and expressively-designed city convertible based on the Skoda Citigo. The exterior stands out with its striking metallic finish in blue and white, and sporty blue-finish 16-inch alloy wheels. There is also a hand-made rear spoiler and a powerful exhaust with two tailpipes. A 1.0 mpi petrol engine with 55 kw (75 hp) is to be found under the bonnet. The sporty interior is based on the interior of the special edition Skoda Citigo Sport. This includes the red-hemmed, leather 3-spoke steering wheel, as well as the leather-covered handbrake and gearstick. The seat covers and floor mats are fitted out with the 'Sports' fabric design, and the instrument panel is finished in red and white. In addition, a special sound system has been installed with an output of 300 watts. The blue LED interior lighting system even responds to music. 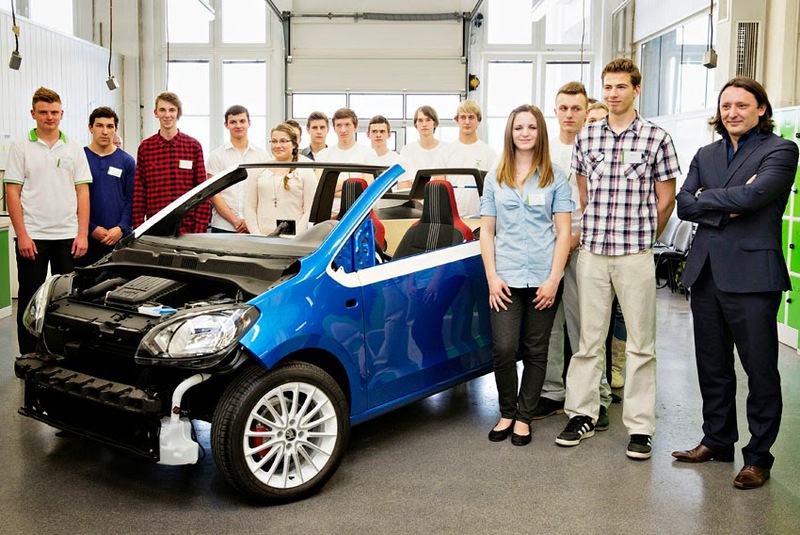 This trainee project highlights the Czech manufacture's commitment to the high quality of vocational training at Skoda. At the Skoda Auto Vocational School of Mechanical Engineering, young people go through a three or four-year training program in technical subjects, graduating with a full apprenticeship or the equivalent of secondary school final exams. There are currently 13 training programmes; the most popular three-year courses being those for auto mechanics, auto electricians and electricians. The most popular among the four-year courses is in industrial logistics. Postgraduate and distance-learning studies are also offered by the vocational school.